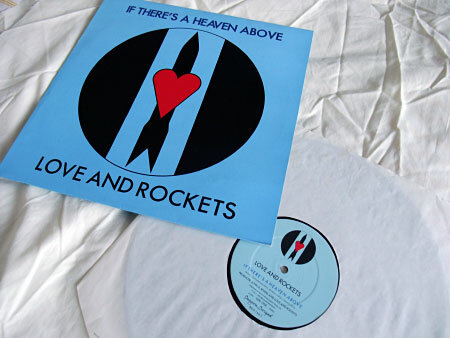 I’m putting together a longer post looking at the various releases on CD of ‘Seventh Dream Of Teenage Heaven’, which was the first album by Love and Rockets, but ahead of that, a quick focus on a Canadian 12″ remix edition of the first single from the album, ‘If There’s A Heaven Above’. 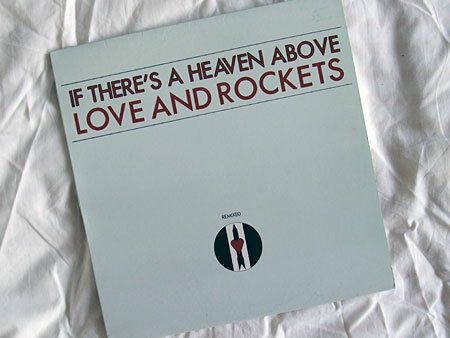 This Canadian 12″ issue is radically different in all respects from the UK editions. 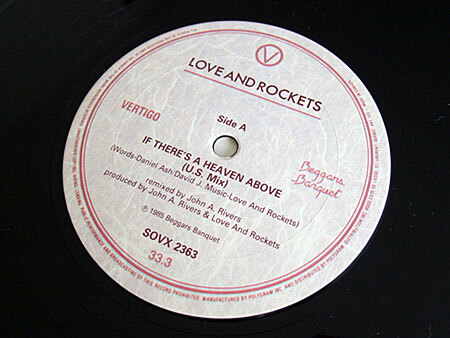 For starters, the A side features a remix of the song (titled ‘U.S. Mix’ on the label, timed at 4 mins 26 secs), while the B side features ‘Inside The Outside’, which in the UK was released on the B side of the various versions of the earlier ‘Ball Of Confusion’ single instead. To top it all off, the sleeve and label designs are radically different too. It is worth noting that this mix of the A side is the same version which is titled ‘Canada Mix’ on the UK CD issues of the ‘Seventh Dream Of Teenage Heaven’ album. It’s a lot more beaty from the very start than the UK mixes, much more going on in the drums department on this mix, which was done by the album’s producer, John A Rivers. I wasn’t too fond of it when I first heard it, probably because I was somewhat shocked that it had totally replaced the regular album version on the original UK CD, but it has grown on me over the years. My favourite version remains the original UK 12″ mix though. ‘Inside The Outside’ on the B side appears to be exactly the same as the UK though. In the UK, ‘If There’s A Heaven Above’ came in a 7″ version (Beggars Banquet, BEG 146), including a 4 mins 10 secs, approx edit on the A side and 12″ version (Beggars Banquet, BEG 146T) including a 6 mins 30 secs, approx, extended version of the A side, which to this day remains one of my all time favourite songs and, in particular, 12″ mixes – at least, the actual mix that was on the original UK 12″, because the version labelled as such on the 1999 CD re-issue is not the same. 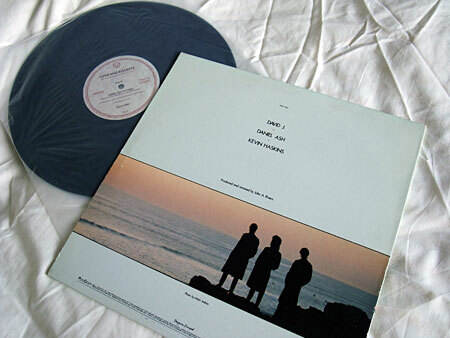 The B side on both the 7″ and 12″ UK versions was ‘God and Mr Smith’ (4 mins 47 secs), a rearrangement of the A side stripping out the main vocals and including copious samples, largely of an eastern bent. This entry was posted on Thursday, August 20th, 2009 at 8:46 pm	and is filed under Versions, versions. You can follow any responses to this entry through the RSS 2.0 feed. You can skip to the end and leave a response. Pinging is currently not allowed. 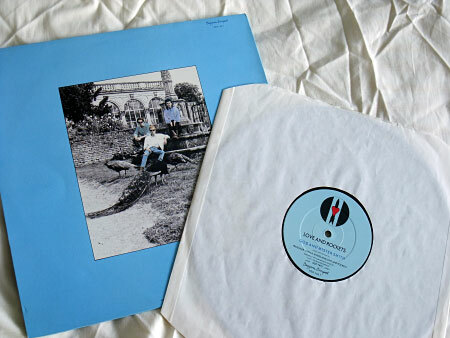 Hi Neil, I have a fairly basic vinyl rip from my own copy – if you have not already come across it, could make a copy for reference, though I note that the release has already appeared. If the 7″ version is approx. 4:10, then I am guessing it is identical to the video version?